Split collars that are used on threaded shafts. Available in USS (coarse) and SAE (fine) thread. Double – steel, black oxide. 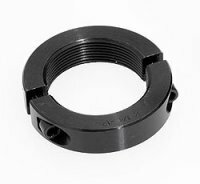 Also check out our selection of metric shaft collars, split shaft collars and stainless steel shaft collars.